An exhibition which outlines the history of taxes in Wales and which encourages visitors to offer their views on the country’s first piece of tax legislation in modern times will be on show in Bangor University’s Management Centre until 28 November. 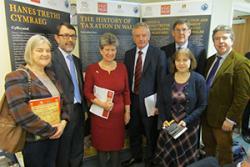 Finance Minister Jane Hutt launched the exhibition in Bangor before attending the first north wales meeting of the Tax Forum. The Forum, which includes Professor Dermot Cahill, Head of Bangor Law School, is a group of stakeholders which provides advice on tax law, administration and the way in which Welsh tax policy and legislation is developed. The Welsh Government is currently consulting on the arrangements for the collection and management of devolved taxes in Wales. These will form the foundation of the first ever Welsh tax regime, and the devolved taxes that we introduce from 2018 will be the first Welsh taxes in over 700 years. Including research by the Law School’s Gwilym Owen and Nia Powell from the School of History, Welsh History & Archaeology, the Taxes in Wales Exhibition traces the history of taxes in Wales, including historic documents from the National Library of Wales. One such grievance was a tax imposed by Llewelyn of three pence on each great beast. This was done without the consent of the people. It did not apply to the whole of Wales. Dr Nia Powell and Prof Huw Pryce, Bangor School of History, Minister for Finance Welsh Government Jane Hutt AM, Bangor Univ Vice-Chancellor Prof John Hughes, Helen Watt, Aberystwyth, Gwilym Owen and Prof Dermot Cahill, Bangor Law School.Another example from an earlier period is food renders (gwestfa) which the free subjects of the native princes paid to support royal government in the several principalities according to the Laws of Hywel, and which lasted until the Union. Although they were paid by the people to support government, they would have had little say in their imposition, which makes them different from modern taxes. Following the Conquest, the Principality of Wales was subject to English taxation imposed by the English Crown. The Finance Minister said: “The last piece of Welsh tax legislation was 700 years ago, and the recent publication of our White Paper on devolved tax collection and management is truly historic and significant. Next year we will introduce legislation that will be the first Welsh tax legislation of modern times. “I would like to see as many people as possible engage with us to help shape the development of a future Welsh tax regime.